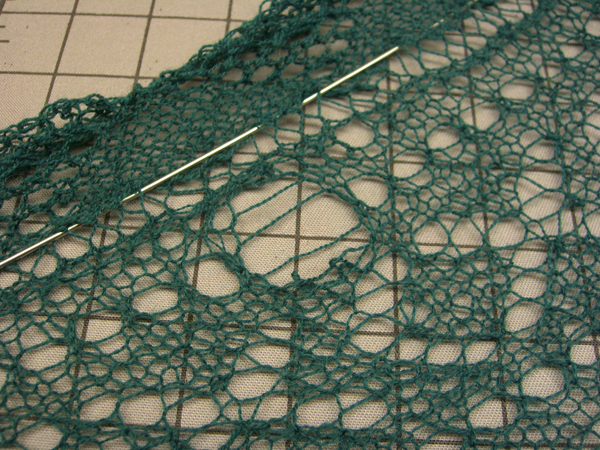 Anyone who wonders why I love knitting lace has only to look at this picture. The Great Green Glob was too big to bock — even at Tangle — all in one go-round. Only half would fit on the blocking board, and there just wasn’t room for the whole thing. Saturday I showed up at Tangle and pleaded my case (no blocking wires, not enough room, etc.) to the lovely Alice, who said that of course I could block in their class room and use her wires and blocking board. I blocked out 1/2 of The Great Green Glob, knit for awhile with the local knitters — Alice has tons of new yarn to fondle, too! Sunday, I unpinned The Great Green Glob and removed the wires. To me, blocking lace is a miracle that never gets tired. On the left, lovely blocked Pacific Northwest Shawl. On the right, unblocked Great Green Glob. Every time I do this, I can’t believe that it will actually stay the way I pinned it out. I love blocking! So after everyone oooed and ahhhed over the blocked part, I started in industriously blocking part the second back in the classroom. I tugged gently on the diagonal to stretch it out. Ting! OMG! A stitch dropped. I jumped back and then stood in abject horror. I’m usually a pretty relaxed knitter, even in the face of adversity. But I actually felt sick to my stomach. I apologize to any Tangle patron who might have heard some rather colorful language from the direction of the classroom. Really, I’m usually more refined. I hope you will understand that I was feeling extreme angst. I stood and pondered and tried to figure out what to do. Note, that this whole time I’m standing all the way across the room from that hole, because I didn’t want to even breath on it for fear the whole GGG would collapse into a great green pile of tangled yarn. I took a deep breath and eased closer. OK. It looked like a dropped stitch. 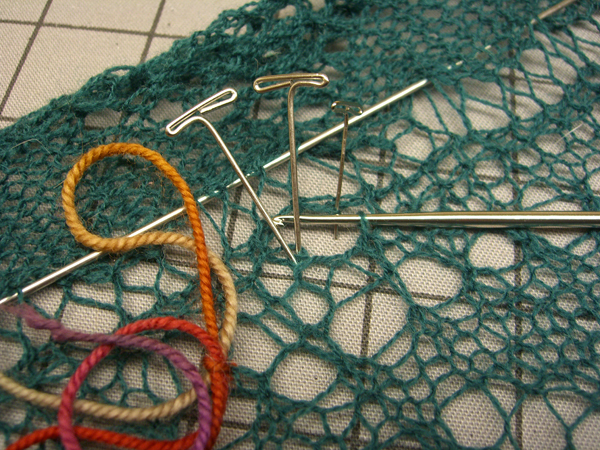 I know how to fix dropped stitches, even in lace. I can handle this. I started searching in my knitting bag. OK. I had some sock yarn that had been left over from some pair of socks. I had this really cool little tool that’s a crochet hook on one end and a dental pick on the other. I had pins. The main thing now was to do enough emergency surgery that the patient could survive blocking. Then, once I could get it home, I still have plenty of that green merino laceweight. I could repair it better at home and with it already blocked. That, at least, was my working hypothesis. I carefully examined the hole. It really does look like a dropped stitch. To actually repair it, I’d have to unravel all of the I-cord and most of the border. Not going to happen. But, I reasoned, I could fix the holes and then, when I get it home, duplicate stitch with the same yarn. It should, I hope, be fairly unnoticeable when I’m finished. So here the emergency surgery is in process. I have some stitches being held by pins, some already tied together with sock yarn, and I’m in the process of closing up the last part of the hole. Once everything was tied together, I finished stretching and pinning. I had to hurry now in order to get it pinned before the classroom was needed for the Sunday afternoon kid’s knitting class. Although they might have actually enjoyed watching me block, I wasn’t sure I was up for that right then. 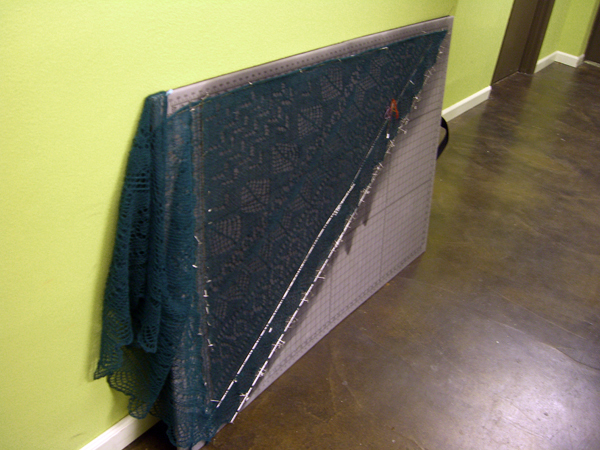 Once it was all stretched out and pinned, I set the blocking board in the hall, where it would be out of the way. Note the orange sock yarn sutures tying up the wound. The already blocked half is carefully pinned up at the corner to keep it off the ground. I could have blocked it larger than I did, had the blocking board been bigger or more room been available. I didn’t block it as severely as I sometimes do. But I do like the way the blocked part looks. Of course, the real mystery is: how did I drop a stitch and not notice it all the way through finishing the last few rows of the shawl, all of the edging, and all of the I-cord. How did that stitch hold together all the way through that without forming a hole? Stay tuned for updates on how the surgery turns out. 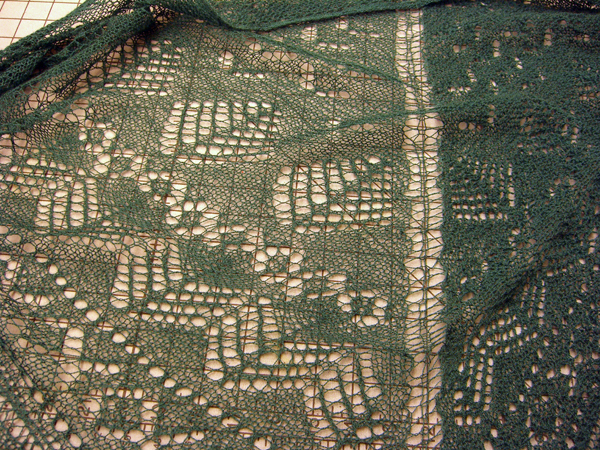 I don’t think I will ever again feel quite so cavalier about blocking lace.